Cold process soap making is really a skill where science meets art. It can take many batches to master the restraint necessary to create a perfectly balanced bar with precisely measured ingredients and temperatures. Making 50 batches of plain white soap can get pretty boring really fast. This is the reason a lot of beginners move onto more complicated recipes involving mix ins and scents, and this is when batches can start to fail. Not to mention the fact that all of these fancy ingredients can place quite a strain on a newbie's pocketbook! 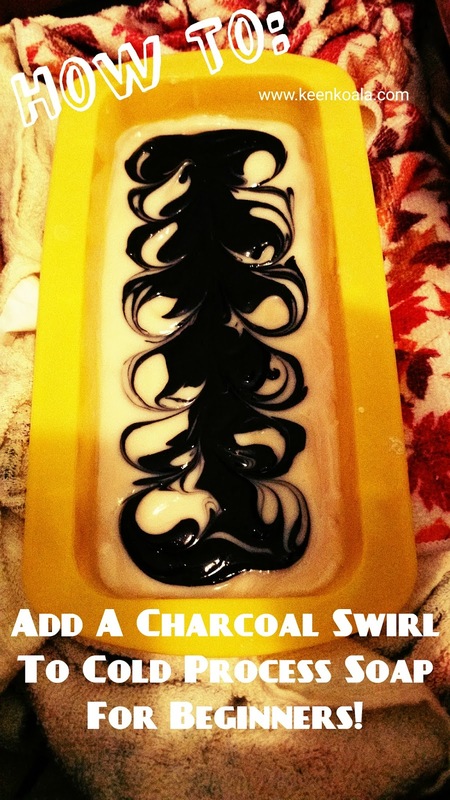 I want to teach you how to accomplish a very easy and frugal mix-in that's perfect for the beginner soap maker, activated charcoal swirls. This mix-in is basically fool proof and creates a beautiful, eye-catching bar that contains an ingredient that is easily accessible and very on-trend right now. 1. A batch of cold process soap that has reached trace. 2. Activated charcoal capsules. You can purchase them on Amazon by clicking HERE (Amazon Affiliate Link). 3. A small container and a spoon. These items cannot be used for food once they have been used for soap making. 5. Latex or vinyl gloves and goggles to protect your hands and eyes as the soap batter is still caustic at this stage. Once your soap batter has reached a medium-light trace. 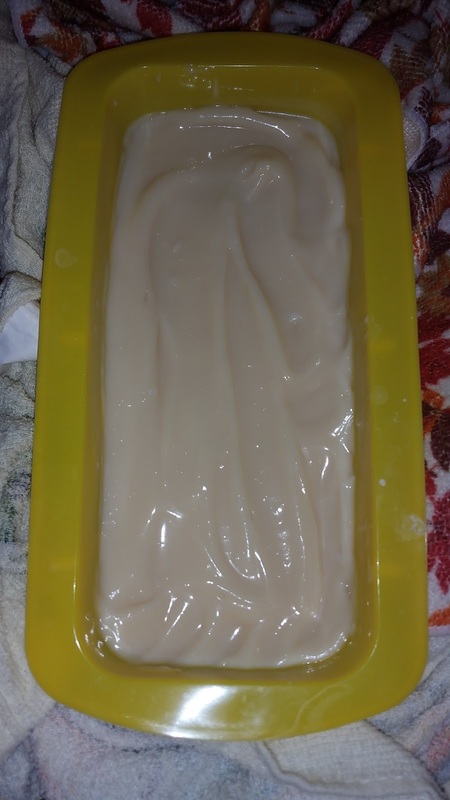 You can pour your soap into a loaf mold. I'm using a 2lb recipe here. Using a teaspoon, remove 1-2 teaspoons of your batter into a small container. I removed a little bit too much here, but it still turned out fine. 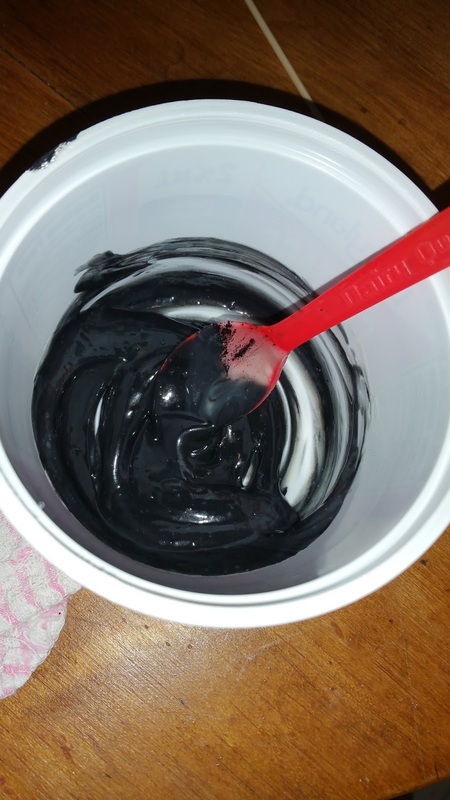 Add the contents of 1-2 activated charcoal capsules into your small container of soap batter. Stir it in well. 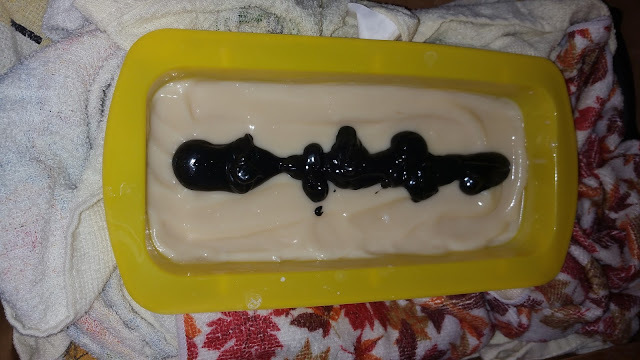 Pour the black batter down the center of your soap mold. Decide whether you want the swirl to go throughout your entire bar, or just throughout the top half or so. For this soap, I just wanted the decorative swirl on the top half. Using your skewer, begin at one end and insert the skewer as deep down into the soap as you want the swirl to go. I went about half way down into the soap batter. 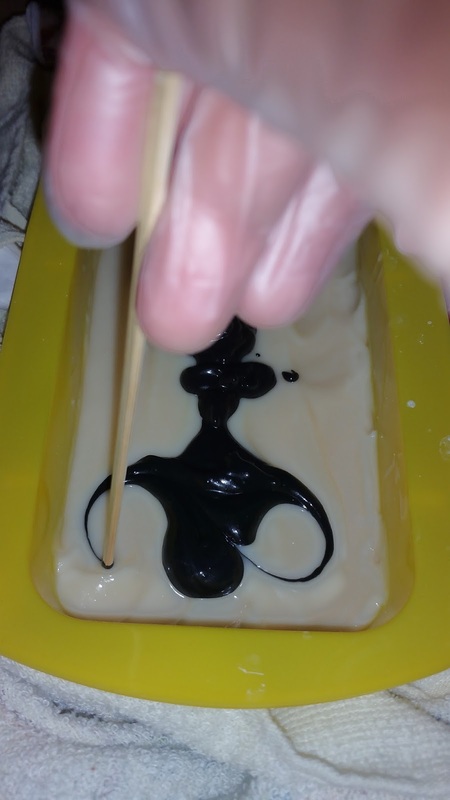 To create the swirls, start to make figure 8's up and down the soap. I did this about 3 times along the length of the soap. As you can see, I made a little bit too much black batter, but it will still look awesome once the soap is cut. And there you have it. A super easy mix in that anyone can do to create a fancy looking bar. I love the black on white look. What are your go-to super easy mix-ins for cold process soap making? Let me know in the comments section below, I am always looking for new ideas and I would love to hear from you. Don't forget to LIKE Keen Koala on Facebook for instant access to the latest posts, exclusive content, and contests by clicking HERE!